Aaron Scott was keeping the company of Kenyans while running the Bath Half-Marathon on Sunday, and enjoyed the race of his life with a fifth-placed finish. The Stamford-based speedster knocked 38 seconds off his personal best, crossing the line in 65:50, and even left one of the Kenyan athletes trailing in his wake. Robert Mbithi won the race in a course record time of 61:44, and became an internet sensation after getting tangled up with the finishing tape and ending up flat on his face when he should have been celebrating a fine run. Jonny Hay, the 2016 England National cross-country champion, was second three minutes behind the race winner. Scott was in a group of three runners all vying for third place at the 11 mile mark, but was unable to react to a move by his Kenyan and American rivals. 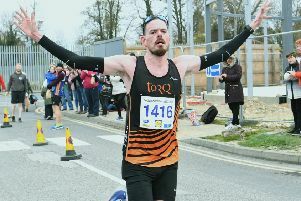 The Notts AC star still finished strongly, in what was a confidence-boosting performance with the London Marathon just six weeks away.